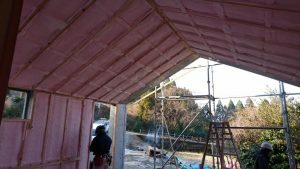 We put the insulation in the dressing room for the resumption of Suzumeno-Yu. With this, you will be able to change clothes with confidence without being influenced by the outside air temperature. 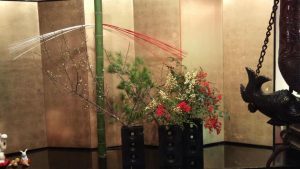 Along with the arrival of Spring, I think we can resume Suzumeno-Yu after the road to Jigoku-onsen opens. Many precious lives were sacrificed. We pray from the heart for the death of those who passed away. This year marks the third year since the Kumamoto earthquake. It still takes plenty of times until the reconstruction. We can move forward because there are people who support us. Little by little, we are steadily progressing. Along with the coming of warm spring, we hope we can deliver even one or two bright news. 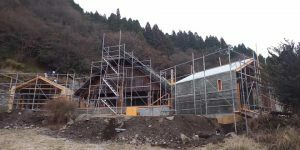 Well, report on the status of the construction of Suzumeno-Yu. 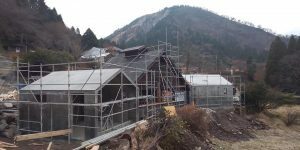 At the end of last year, concrete was poured into the concrete form of the dressing rooms at Suzumeno-Yu. Yesterday, the form was finally removed. 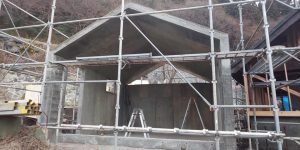 To protect the old building of Uchi-Yu from both sides, dressing room for men and women appeared. It is quite an atmosphere! 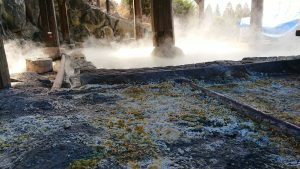 Well, during the New Year’s holiday when the construction of Suzumeno-Yu was closed, crystals of alum and sulfur which had been increasing secretly spread. We will continue the construction in order not to destroy these crystals in the future, so please look forward to it as well. It is more beautiful than the one in the picture. Look forward to your continued good will in the coming year. I along with my staffs wish you a year filled with peace, good health, and happiness.